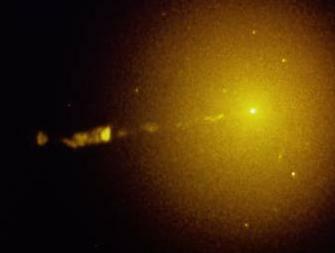 HST image of M87's jet. Space Telescope Science Institute astronomers and their co-investigators have gained their first glimpse of the mysterious region near a massive central object at the heart of a distant active galaxy, where a powerful stream of subatomic particles spewing outward at nearly the speed of light is formed into a beam, or jet, that then goes nearly straight for thousands of light-years. 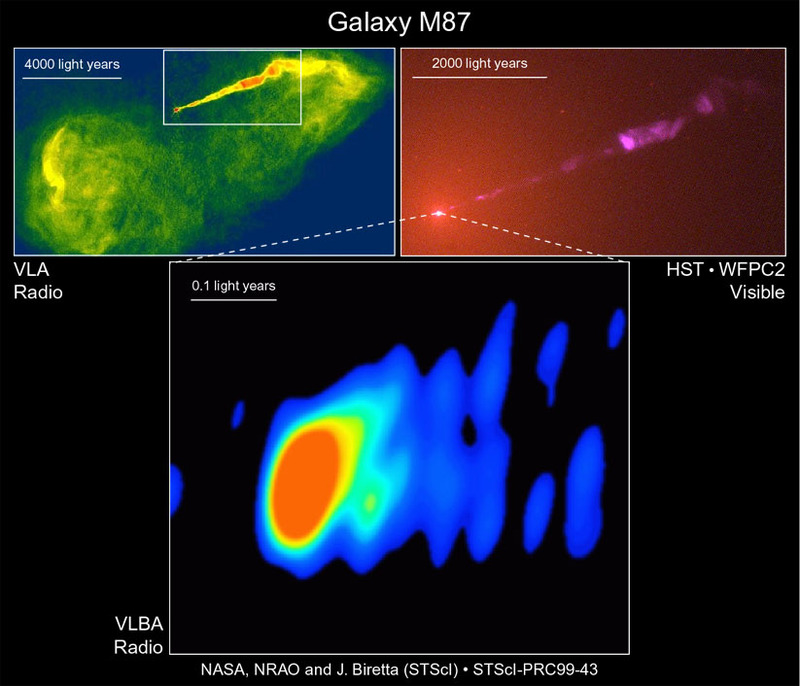 The astronomers used radio telescopes in Europe and the U.S., including the National Science Foundation's (NSF) Very Long Baseline Array (VLBA), to make the most detailed images ever of the center of the galaxy M87. 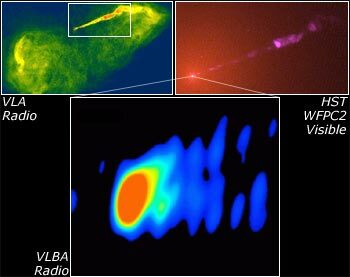 [top left] - This radio image of the galaxy M87, taken with the Very Large Array (VLA) radio telescope in February 1989, shows giant bubble-like structures where radio emission is thought to be powered by the jets of subatomic particles coming from the the galaxy's central massive object. The false color corresponds to the intensity of the radio energy being emitted by the jet. [top right] - A visible light image of the giant elliptical galaxy M87, taken with NASA Hubble Space Telescope's Wide Field Planetary Camera 2 in February 1998, reveals a brilliant jet of high-speed electrons emitted from the nucleus (diagonal line across image). The jet is produced by a 3-billion-solar-mass central object.